This weekend is your last chance to visit the Los Angeles County Fair until it comes back around next year, and unless you’re having elective surgery on Saturday, you should really make an effort to get out there and see it. My wife and I went to the fair a couple weeks ago, and we had an absolute blast. 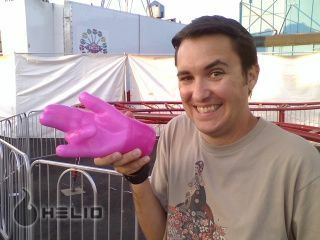 While there’s certainly deep fried everything on a stick and lots of crazy carnival rides, there are a lot of other great reasons to make the drive to Pomona, including the opportunity to make The Shocker, in pink wax, out of your own hand. The fair is epic in scale, and though there were maps everywhere, we decided to just wander around and keep moving forward until we got to one end. This gave us the freedom to just wander through the silly sideshow stuff like the world’s smallest horse (allegedly) and the countless aisles of shopping pavilions, where we saw every possible version of a hot tub and above ground pool in the known universe. There was the obligatory petting zoo, lots of surprisingly good beer (Newcastle, Sierra Nevada, and a few IPAs in addition to the usual NASCAR swill) and more food than you can shake a deep fried Snickers on a stick at. The greatest thing for me, though, were the indoor shopping areas, which were like live versions of infomercials for everything from cleaning products to miracle vegetable choppers to knives and cookware. There was some horribly wonderful clothing and, uh, decorating, to be enjoyed, as well, and everyone presenting their products was as enthusiastic as that British dude in the bow tie from Amazing Discoveries. Admission was $15 per adult, but I understand that you can get discount coupons at McDonald’s and Ralph’s, and you don’t even have to buy anything to get them. If you go, do yourself a favor and skip the “preferred” parking for an extra $5. Park in General Parking and enjoy the 3 minute walk to the gate. At the end of the day, when all the suckers who paid too much for “preferred” parking are fighting to get out one gate in the front, you’ll be breezing out the rear exit in less than ten minutes. And after a day spent at the fair, the last thing you want to do is spend a lot of time sitting in the parking lot trying to leave. There are a few pictures of our visit in my Flickr stream. Damn, how do I manage to miss this every year? I’d love to catch it this weekend, but I’ll be occupied with the Swerve Festival. I breezed out the preferred exit last Saturday night. Last time I went to the fair I just remember the walk back to the car in the non-preferred lot seeming like an eternity, and the crowd to get out seemed even worse. I imagine it’s all a matter of when you arrive and when you leave that makes all the difference. It was at least a 3 minute walk from where I was parked in PREFERRED to the entrance, but I have no doubt it would have been worse in general. Plus it was raining that day, so the extra $5 seemed more than worthwhile. I’m guessing you arrived early and left early. I arrived at 4pm and left at closing (midnight). OMG you are so funny in that picture! Previous PostPrevious From abLA :: LACE this September! !